Being the big fan of Netflix that I am, I jumped at the chance to watch a new series from the same people who did Orange Is the New Black. I am now requesting every single one of you go see GLOW. 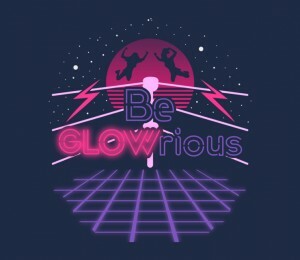 It is, as this T-shirt suggests, a GLORIOUS way to spend your time. And after you get done watching a few episodes, go ahead and buy this T-shirt, ’cause you’re gonna want to brag to all of your friends that you’re up on the awesomest show on Netflix.